This is the first post of a series on Mindful Living. This series will help you deal with daily life and tasks using mindfulness, which will allow for a new perspective and can help calm the mind. For more information on what Mindfulness and Mindful Living, please see this post What is Mindfulness. Aggressive drivers, long commutes, and unexpected delays are all a part of the driving experience. It's one of the most daunting daily tasks of most people. And we always seem to be in a hurry, even when we're not. Because it is a daily task for many of us, it's important to make it less of a stress and more of an opportunity to practice mindfulness. We have the time for music, audiobooks, news, talk radio, etc, why not turn off the noise and strengthen your breathing routing? Turn off the noise. Talk radio can be toxic, so can music. Turn it off for a bit and turn within. Practice a simple breathing exercise, like this: Let your breath come in and out naturally, and recite the following (no, you do not need to say it aloud:) I am breathing in. My body is filling with air. I am breathing out. My body is releasing the air. 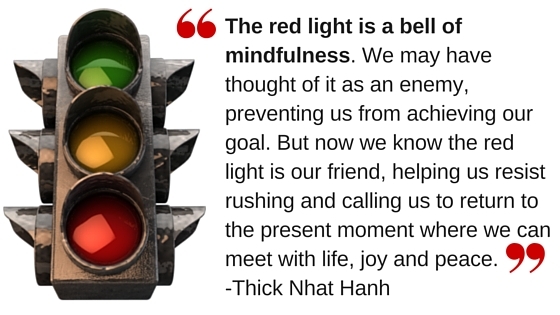 When you arrive at a stoplight, stop sign, or traffic jam, use that moment to take in a cleansing breath. Keep your car clean. A cluttered car isn't going to help clear out a cluttered mind. A clean car automatically gives you a healthier perspective. Wear comfortable shoes. Take off the heals and boots, and put on a comfier pair. Get rid of the toxic air fragrances. If your car doesn't smell good, clean it out and add a more natural aroma. If possible, change your schedule so you can skip some of the rush. It will help the environment and your mental state! Also try to remember that the person driving next to you isn't your enemy. And always, always, always drive safely, paying attention to signs and laws.